Now you know how many phases you have, and whether you have a controlled load tariff, we can get the numbers we need from your electricity meter or meters. If you have a smart meter that transmits its data wirelessly to your retailer, you can ask them for the data. It is logged every 30 minutes, so it’s perfect. The downside is that it can take many weeks for the retailer to log into their system and press the big red button that says ‘send customer their data’. If you do have a smart meter, ring up your retailer and ask them for this data now. You might be lucky and get it quickly, or you may be able to log in and see it immediately. If you don’t want to get your energy retailer involved, don’t want to wait, or, like most Aussies, don’t have a smart meter, traditionally you’d have to spend a couple of hundred dollars on an energy monitor and another couple of hundred to get it installed by an electrician. We’re going to do this the cheap and cheerful way – manually. You’re simply going to have to look at your meter (or meters) four times. We want to break our meter readings into two chunks a day, giving us a night-time usage and a daytime usage. We’ll do this by taking meter readings at 7am and 7pm on a work day and a non-work day. If you don’t work, you should still take readings on a weekday and on the weekend – as you probably still behave differently on a weekend. It is important that you do this on a typical usage day. If you don’t normally have your heating or cooling on, don’t choose a day when the air conditioning is cranking. First, count your electricity meters. Have a look in your meter box and count how many electricity meters you have. The meter is a box about the size of a brick. It will have either a digital or a mechanical numeric display. If you have one meter, that’s the one you need to read. If you aren’t sure, send a picture of your meter box and a copy of your bill to [email protected] and we’ll advise what meters you’ve got and how to read them. If you have two meters, the most likely configuration is that one is for your regular tariff and one is for your controlled load tariff. If they are not labelled, put the oven and kettle on and see which meter goes up the quickest. This is your ‘regular-tariff’ meter (the expensive one), and the one we want to read for this exercise. Most people in Australia (especially those in New South Wales, Queensland and South Australia) can use electricity at a cheaper rate to power their water heater (and sometimes their pool pumps). This is commonly referred to as ‘off-peak hot water’, although the retailers call it a ‘controlled load’ or ‘economy’ tariff. It is called a controlled load because the electricity company can choose when to supply the electricity to your hot water system. They literally control your load. This electricity is cheaper because they only supply electricity on this tariff when wholesale energy is cheap. To control your load and charge you a separate rate, they either fit a second meter for your controlled loads or have a single multi-function meter with two outputs and two digital displays – one for your regular loads and one for controlled loads. If you get solar power, the output of the system is usually wired into the ‘regular’ meter input5 so your solar offsets the most expensive electricity. For this reason, we only need to read your regular meter to work out how much solar power will save you. Your solar will not be connected to your economy meter, so it will make no difference to that part of your bill. This isn’t a big deal, as the controlled load (see Figure 2.4) is usually a small fraction of your total bill, and if you follow the advice in STEP 3: Heating Your Water, it will reduce or be eliminated altogether. Got three meters? Then you almost certainly have three phase power where each phase is metered separately. This style of metering is slowly being replaced with a single meter that does the same job. But because you still have the old-school three-meter system you’ll need to read all three meters and add them up to get one total figure. If you get solar panels, these three meters will be replaced by a single meter that does everything. 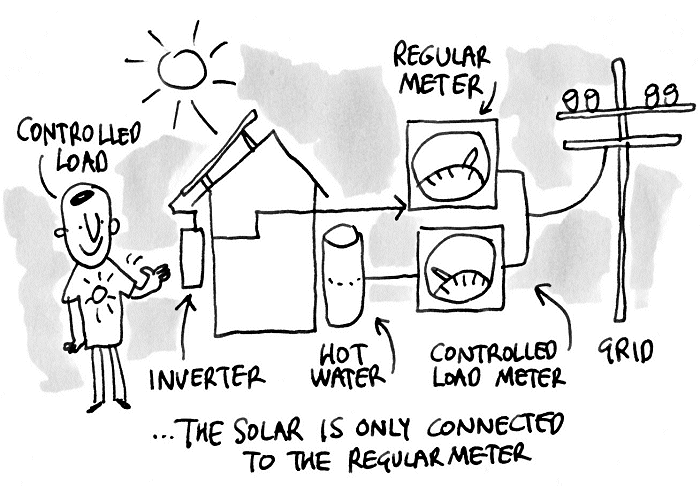 Figure 2.4 The solar power is only connected to your regular-tariff meter; the controlled load meter remains separate. Got more than three meters? This is getting silly: send a picture of your switchboard and a copy of your bill to [email protected] solarquotes.com.au and we’ll work out what’s going on. First, I’ll explain how to decipher the meter’s dials or display; then, I’ll explain when to read it. If you have a really old electricity meter, it will have dials that you have to read. These meters are rare, and I give instructions on how to read them here: solarquotes.com.au/oldmeter. Figure 2.5 A mechanical meter with reels. The meter shown in Figure 2.5 is super easy to read – the only thing to look out for is the decimal point (shown as a comma here). This meter reads 36,879.3 kWh (it is actually halfway between .3 and .4 – but a tenth of a kWh is nothing in the scheme of things, so don’t stress out about the last digit. The one that’s most visible is the one to go for. In this case, either 3 or 4 will do). An electronic electricity meter will have a digital display. It will usually switch between a few different readings, displaying each one for about five seconds. If you don’t have a controlled load tariff or time-of-use tariff then you need to wait for the display to show ‘ kWh’. There may be a large space between the ‘ kW’ and the ‘h’. Then write down the numbers that are displayed largest. Figure 2.6 – A digital meter. 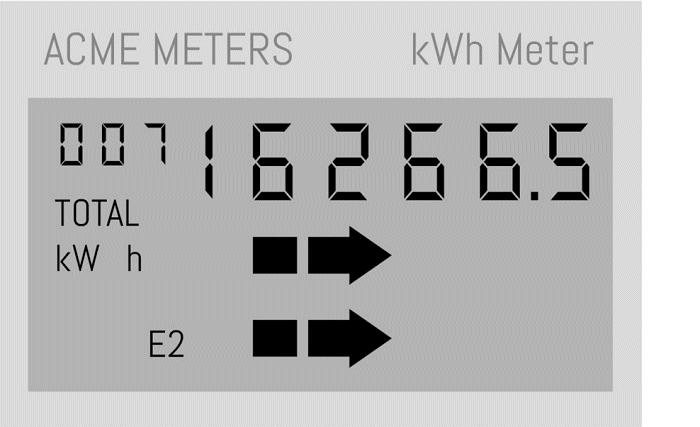 If you have a controlled load tariff and only one meter, or time-of-use billing, then one of the kWh displays will show your total non-controlled usage and one will show your controlled load usage. You may also have up to three other displays showing your use at off-peak, peak and shoulder times. Confusing or what? This should give you a page that shows what screen you need to read to get your ‘total energy’ or ‘peak energy’ usage. The information is often based on who your local electricity network is. For example, if I got my bills from Simply Energy and lived in south-east Queensland (covered by the Energex network), Google would show me the information in Figure 2.7. Figure 2.7 Meter-reading information from Simply Energy’s website. I want to know ‘total energy’. This information is in the third column. If my electricity meter says EM1000 on it, I read the screen with a ‘blank’ label. If my meter says EM1200 or EDMI Atlas, I read screen ‘01’. They don’t make it easy, do they? The system is designed to confuse, so if you want to skip this step, you can, as described earlier. 5Some people who have a high consumption on their controlled load choose to add a second solar power system and wire it into their controlled load meter, but this is rare so I won’t cover it here.